I thought it was so interesting when Donna described herself to me as an “Accidental Artist”. The truth is there is no accident to how beautiful her paintings are! I first discovered Donna’s work while picking up my giclee prints at my printer, Palette Arts in Nipomo, Ca. He was scanning her gorgeous paintings and to see them in person, they literally took my breath away. 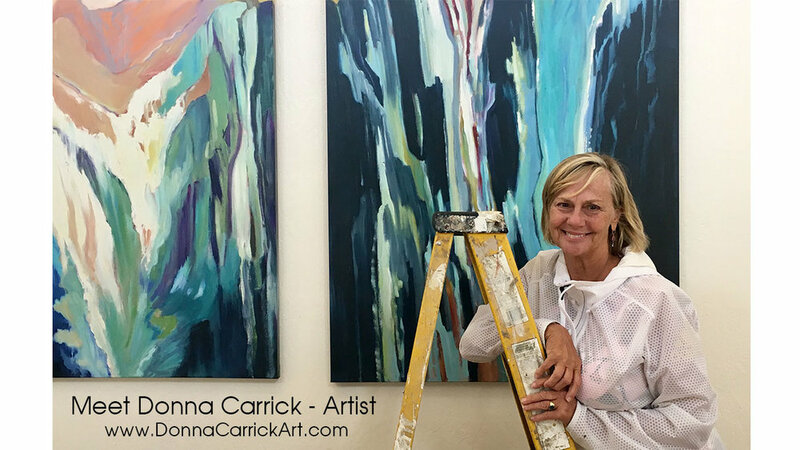 Donna’s paintings are inspired by her life while living in Kauai which she still does for a couple of months every year. Her subjects include botanical wonders; orchids, banana flowers, breadfruit, matilija poppies and succulents. Donna loves the beach and strives to capture the ever changing colors of the ocean in coastal land and seascapes. But here’s the thing that I LOVED most about our interview. Donna took a very long break from when she first studied Art at the prestigious Otis Art Institute in Los Angeles, to not really beginning to paint until she had retired several years later. And Thank Goodness for us she didn’t just retire and never paint again. In fact, quite the opposite. She told me her new motto is to “Live Dangerously!” That as people get older they tend to be more careful about everything but not Donna. She is painting and traveling and living life to it’s fullest. Let’s just all take a moment to think about that. So if you think you’re too old to start something new, even another career, there are many people who would disagree. You are never to old to create a new dream! Part of being the Featured Artist on the Podcast is the artist generously offers 3 prints for sale, the month they are featured, with the proceeds going to the Louise Monforte Memorial Art Scholarship. These are the gorgeous botanicals now available in the Give Back Category of my Shop. Aren’t they stunning!!! I know you will enjoy Donna as much as I do. She is not only warm and charming but an incredibly gifted and beautiful soul. Her work can be seen at Marisol at The Cliff's Resort & Spa in Shell Beach as well as Pu'uwai Gallery in Hanapepe, Kauai.